 This collection of essays addresses the evolving goals, functions, values, and even definitions of museums since the end of WW II. It draws from 32 papers delivered at a national seminar entitled ``Gender Perspectives: The Impact of Women in Museums.'' The editors are staff members of the Smithsonian, as are many of the contributors, both men and women. Although women were essential in founding, funding, and staffing museums, the thesis in Part I is that women do not hold positions of power, a contention that would appear to be challenged by the female participants themselves, all executives. Kendall Taylor's sound historical study shows too, among other things, that the role of women in museums tends to reflect, even anticipate, their role in society. Later in the collection, another solid essay by Lois Banner charts three stages of feminist studies (from ``oppression studies'' to ``post-structural feminism'') and contradicts the personal experiences that make up much of the volume. But it is here that the diversity of what we call museums and the people who run them becomes apparent: the contributors hail from high-art collections, children's museums, science and technology museums, and ethnic museums, specifically African- American. Many are concerned primarily with education, social commitment, and community values rather than with the more traditional tasks of curating, preserving, and restoring. 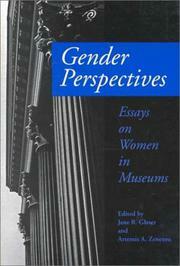 All the essays illustrate how the emergence of women has coincided with the new functions, goals, and values of museums. The quality of the essays is uneven, the writing poor, the sense of audience unfocused (``Who are we as women in the museum world?'' the editors query). Post-conference editing would have given the collection some badly needed coherence .